This comfortable and quiet first floor room known as 'The Emily Dickinson' at Gabriel's Condominiums has Pergo flooring and a spacious full bath with tub/shower. The room is comfortably sized ('motel-style') with a full size (double) Tempur-Pedic bed. Other highlights include a gas fireplace, AC, ceiling fan, larger mini fridge, Free WiFi, and flat screen TV & DVD. This room offers the very best center of town location just behind Town Hall on Bradford St and adjacent to the Bas-Relief Monument Park. You are steps from restaurants, bars, shopping, and beach. The grounds of the complex offer a beautiful, serene garden and common deck with plenty of outdoor seating. There is direct access to the Bas-Relief park. The condo is a cozy, “motel style” room - no kitchenette (no stove). Pets are considered for an additional fee - certain rules apply. Parking for 1 car is included nearby in the Monument Parking Lot from April 1 to October 31. No meters are in effect from November 1 through March 30. The condo was comfortable and clean. The location was the best part. We were literally under the Pilgrim monument and in the center of town. Free parking and free admission to the pilgrim monument and museum, which was a perfect activity on a rainy day. Would absolutely stay here again. Cozy Base in Center of Town! Small, unpretentious and pleasant studio, very cozy and comfortable, perfect for my needs, at an affordable rate! The property has private gardens and sitting areas which are ideal for relaxing. 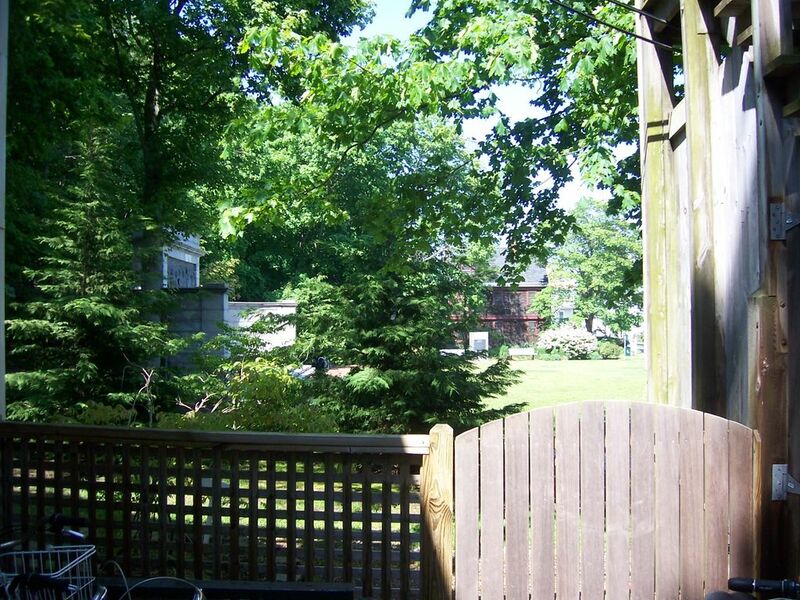 It's location, with entrance to the park, directly behind Town Hall, in the center of town, is perfect! This is a quiet, peaceful place to base yourself, with all you could want to do, literally steps away. I look forward to my next time in Provincetown, and hope that this unit will be available! the room is small - maybe 10X8 with a step up to a serviceable bathroom. i was aware that this was a small place and the size was not an issue for us. what was an issue was the cleanliness and repair of the unit. this unit is NOT managed by gabriel's hotel provincetown which manages the rental of most of the units in this complex: those units are gorgeous. this unit was filthy. the cleaning utensils were in the hallway and included a dirty old ring-out mop and a broom. the floor was so dirty upon arrival our feet were filthy and we wore socks at all times inside the room. the furniture looks like it was collected from the sidewalk of a college student's move out. a very heavy full length mirror was affixed to the unit's hollow door and fell during our stay. it didn't break but it was representative of the neglect of this unit. the bathroom fixtures are the cheapest contractor grade circa 1985. there was no rain during our week long stay, but the room was never dry. having the air on made it cold and wet. yuck. the storm window of the unit is shattered and this is just indicative of the neglect and disrepair. the baseboard heating unit had not been cleaned for ages. double yuck. it's dreary and dark. if you're wondering after all this why i gave it 3 stars - i'll tell you. the manager was responsive to our request to send over fresh sheets and towels mid way thru our stay which made it bearable. you see, the towels never dried in the room and the linens were damp and tacky to the touch. the rental agent was courteous and professional. we told him about the mirror falling he sent over replacements for the cups and glasses that broke in the mirror fall. the location of this room, and the parking pass also make it 3 stars. again, the size of the space was not our issue - the condition and cleanliness were. in fairness, we did not mention the abhorrent cleanliness issues to the rental agent. we were there with our stuff and dog and what was the point. any cleaning once we arrived would have been chaos in a 10x8 room with 2 people's stuff for a week and their dog. was it worth $900 for the week? yes and no. yes if it had been clean and well-kept. clearly this owner does not care about this unit, which is sad . next time we will rent either the "hope" room or the "grace" room in the same complex managed by the provincetown hotel at gabriel's. this is the same complex and for close to the same price. do your homework! Very clean comfortable room with many amenities such as microwave, refrigerator, ac & full bath. Centrally located right in the center of town but situated in a quiet complex filled with beautiful gardens & sitting areas. Pet friendly easy first floor entry. Would recommend! The unit is inexpensive and for the money a good buy but buyer beware. Its listed for two but this unit would be ideal for a single person. It has a great location. The barbecue outside is in need of a GOOD cleaning. Drying towels when used is impossible when its humid out. The AC unit does not help in keeping the damp feeling out of the room. When we arrived at the unit it was ready early but to be honest it could have been cleaned better. The floors were very dirty and the bathroom needed some more cleaning. Make sure you ask for extra towels. We thank our renter for pointing out the great value offered with this studio condo - the location and the grounds are unbeatable! We are right in the center of town - a tranquil retreat - yet steps away from all that town has to offer. As this renter had previously rented the adjoining suite and is familiar with the property, we were surprised that he was disappointed. There is a brand new built-in A/C this season. It is understandable that the heat wave and humidity which all of New England experienced during this particular week was frustrating, which is why we hired our normal weekly cleaning staff to provide additional towels. We value our guests and truly strive for happy returns! I have stayed here multiple times (at least one week a year for the last four years). It is a really good deal in that it is relatively inexpensive, walking distance to everything in town, comes with parking close by, and is pet-friendly!